It is hard to believe that food that tastes this good, and only takes ten minutes to make, is also so healthy. This is what fast food ought to be! 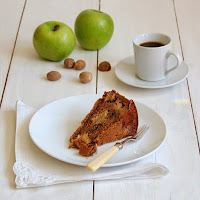 Making five healthy recipes was on my May bucket list. They are all equally tasty. Enjoy! 1) Put the chicken breasts on a chopping board and very carefully slice horizontally through the middle. Open out into two halves. 2) Sprinkle half the lemon juice over the chicken. season on both sides with a little salt and plenty of freshly ground black pepper. 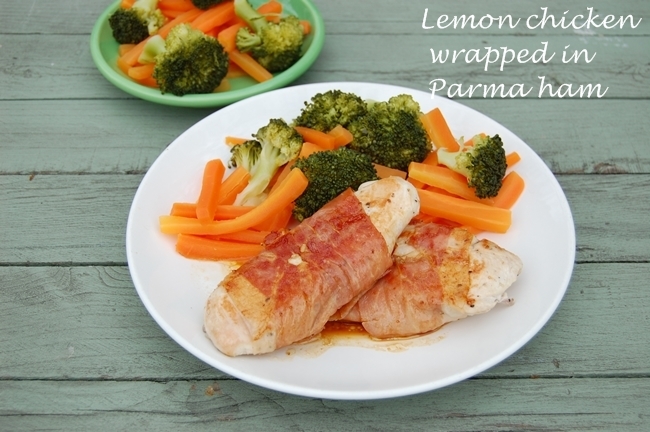 Wrap each chicken piece in parma ham. 3) Mist a small non-stick frying pan with the oil and place over a medium heat. As soon as the pan is hot, fry the chicken on each side for about 3 minutes, or until cooked through. Transfer the chicken onto two warmed plates. 4) Drop a knob of sunflower or olive oil spread into the pan and, as soon as it melts, pour over the remaining lemon juice and water and stir together for a few seconds until the sauce is smooth. Pour over the chicken and serve. 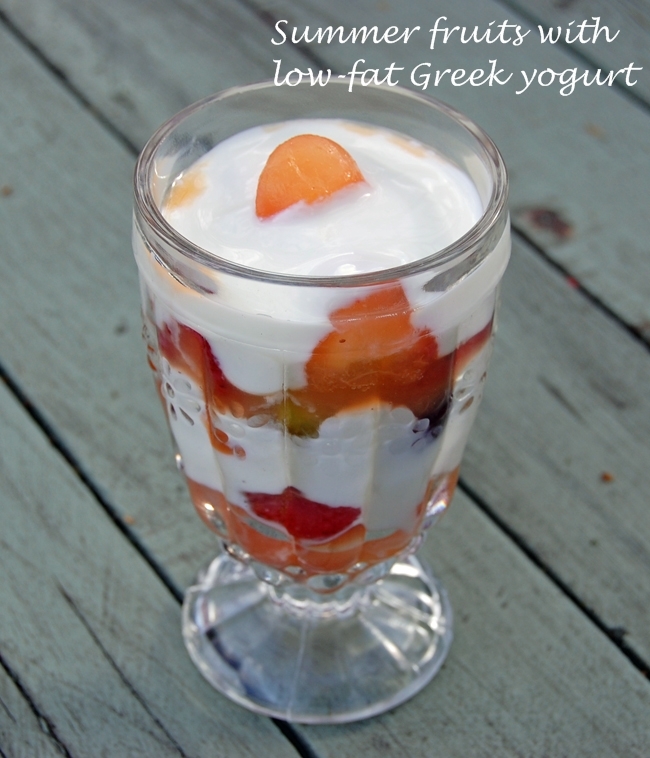 Place a layer of fruit in the bottom of a dessert glass. Then spoon a layer of yogurt to cover. 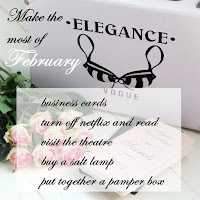 Repeat two or three times. This refreshing dessert is a lovely way to finish an outdoor meal. 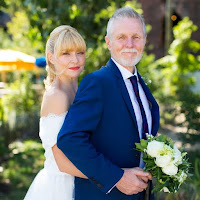 Sometimes I find eating healthily can be a little expensive, so I have included this recipe in which I used frozen fish fillets and olives from a jar. It still is delicious. 1) Preheat the oven to 200 degrees C/gas 6. put the fish in a shallow, oven-proof dish with the tomatoes. Scatter over the olives and onions. Season with plenty of freshly ground black pepper and a little salt. 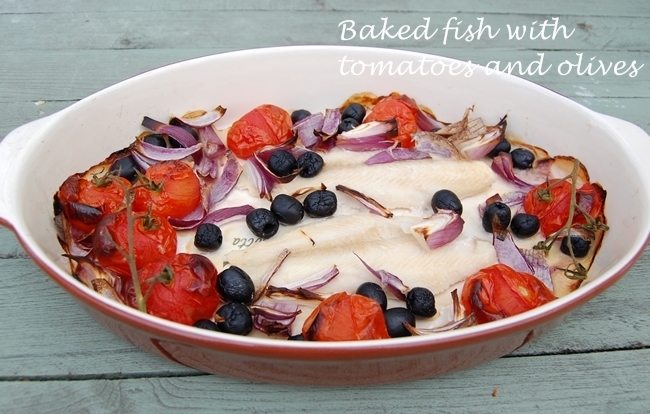 2) Bake in the centre of the oven for about 16 minutes or until the fish is cooked and the tomatoes are softened. 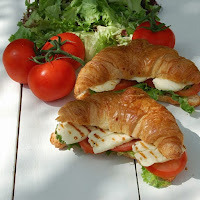 3) Serve with heaps of freshly cooked vegetables or a large, lightly dressed salad. This is another absolutely delicious meal that is so quick and easy to make. So tasty and all in made in 15 minutes. dark soy sauce to serve. 1) Mist a large non-stick frying pan or wok with the cooking oil and place over a medium heat. Season the salmon generously with black pepper. 2) Put the salmon in the pan, skin-side up, and cook for 4 minutes. Flip over and fry on the other side for a further 3-4 minutes or until just cooked. Lift the salmon carefully onto a small plate, cover loosely with foil and leave to stand while the vegetables are cooked. 3) Pour the oil onto the frying pan or wok and and the vegetables. Stir-fry over a medium heat or 3-4 minutes, or according to the pack instructions, until just cooked. Sprinkle with a little soy sauce and toss well for a few seconds more. 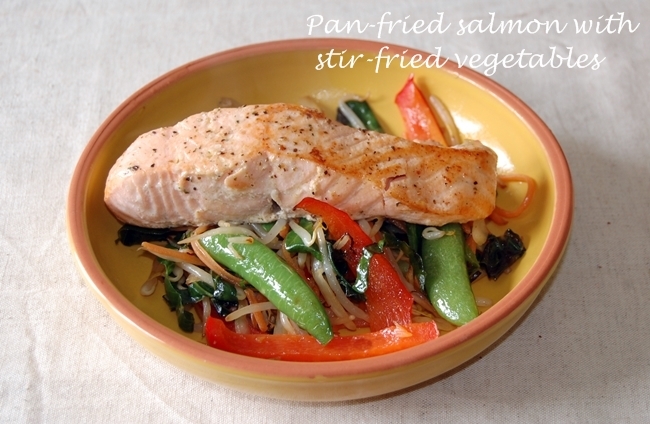 4) Spoon the vegetables onto serving plates and top with the salmon fillets. Serve immediately. 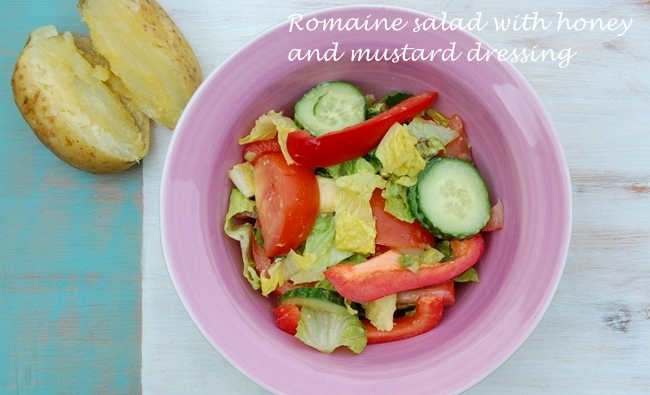 A crisp salad with lovely warm flavours. 1) Cut lettuce leaves into 1/2 inch pieces and place in a large bowl. Add the cucumber, peppers, tomatoes and herbs. 2) Halve, peel and pit the avocado. Cut into 1/4 inch slices and place in a small bowl. Toss in the lemon juice to prevent discolouring. Add the avocado to the salad. 3) Place the dressing ingredients in a bottle or screw-top glass jar and shake together. Pour over the salad and toss well. I served this with a small jacket potato with a little knob of spread. Oh yum, these all look so good and fresh and yummy, thanks for sharing!